When decorating your home for the holidays bring a few simple festive touches into your bedroom. We love the way these three designers created a holiday look with simple wreathes and greenery. 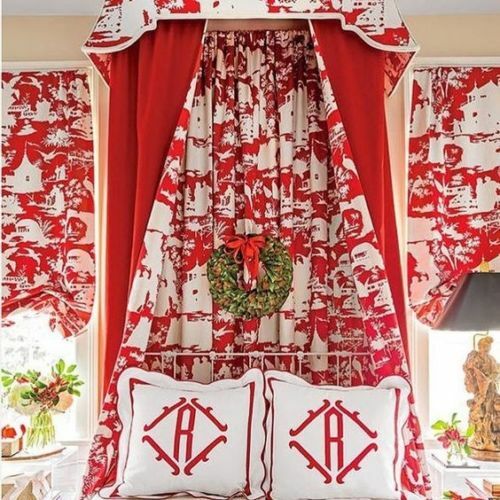 Caroline Robert, of Perch, adds a simple green wreath to a red and white guest bedroom. Anne Maxwell Foster and Suysel dePedro Cunningham of Tilton Fenwick bring the holiday decor into the children's bedroom, adding felt pom wreaths to the foot of each twin bed and a touch of garland to the headboards. Margaret Kirkland adds a glam gold bow to a simple wreath, to create a festive focal point.